The Lastertac TM is a compact and rechargeable laser sight that is specially designed to fit subcompact pistols but also works well with various compact handguns. The bright laser comes in either green or red and is visible in both light and dark environments. Easy to use ambidextrous push buttons located on both side of the laser allow user to quickly turn on or off the laser. The built-in battery can be easily recharged using the Micro USB and power unit provided. Dimension: L x W x H = 1.75 in.x 1.25 in x 1.38 in. Bright laser you can see day and night. 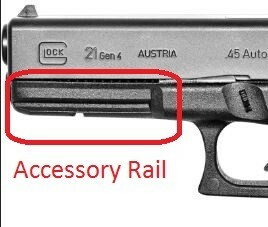 This laser sight requires an accessory rail. Fitment is spot on. Ease of mounting and laser adjustment couldn't be easier. Thanks for the speedy shipping also. Great price, great product and fabulous customer service.